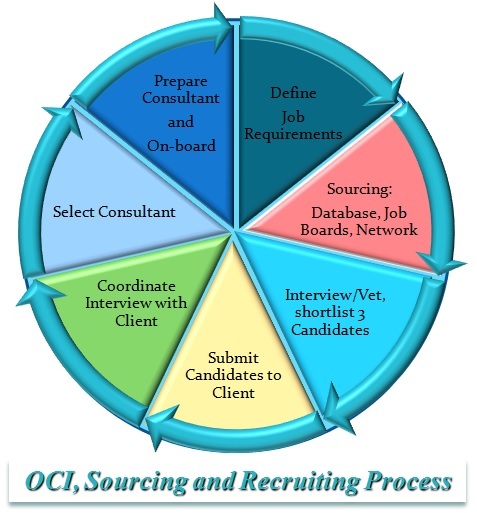 Recruiting Process | OCI Inc.
Business: Understand local, national and global clients’ business sector and their position within market place to help develop ideas to proactively grow their business. Strategy: Understand client talent acquisition strategy and plans including: management, growth, retention, training and benefits. Plans: Maintain awareness of client long term and short term business and talent acquisition and management plans that deliver on client strategy. Culture: Understand client communication, values, preferences, priorities, decision-making, and management structure and style to help understand their requirements and best culturally suited candidates. Job Requirements: Fully understand and contribute to developing clients Job requirements including objectives, responsibilities, reporting structure, mandatory and desired requirements covering hard and soft skills. Risks and Constraints: Duration, budgetary/financial, legal, security and privacy constraints and locations preference. Engagement: Engage highly specialized and high performer consultants through their careers to ensure availability of best of breeds consultants for client needs. Networking: Maintain a network of highly specialized professionals in various domains business and technology domains to complement OCI traditional sourcing and ensure resources availability for client on-demand and urgent needs. Sourcing: Continuously and proactively acquire professionals with core and emerging business and technology skills from a wide range of job local, international job boards to maintain an up-to-date OCI skills database. Interviewing: Screen and interview candidates proactively and on demand and establish professional profiles to ensure readiness, best fit and availability when needed. Vetting: Vet and test consultants on job’s hard and soft requirements, skills, certifications, cultural fit, locations, salary/rate expectations, availability and flexibility. Selection: Short list best suited candidates based on experience and skills requirements and taking into consideration location and availability. Preparation: Prepare consultants with a thorough briefing about the client company business, culture, reporting structure, role objective, responsibility and its impact on corporate goal. Placement: OCI account manager will work with client to coordinate consultant placement and ensure smooth first day at the job.